Attack took place in the Petah Tikva open air market on Tuesday afternoon, hitting a currency exchange on Guttman street. A grenade was tossed in the Petah Tikva open air market (shuk) on Tuesday afternoon, hitting a currency exchange on Guttman street. The explosion wounded five people. Hatzalah and Magen David Adon (MDA) paramedics treated their injuries at the scene; all five were transported to Belinson Hospital in Petah Tivka and are in light to moderate condition. 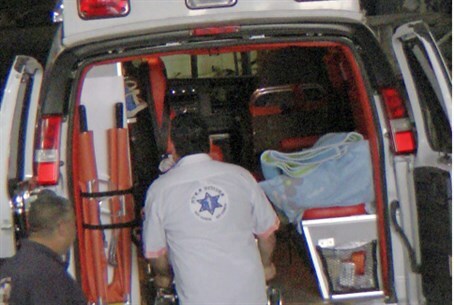 "We rushed to the scene with a large squad of ambulances and mobile intensive units," Chaim Drori, director of the Yarkon district of MDA, stated to Arutz Sheva. "We found five people injured from shrapnel wounds there. It looked as if a grenade had been set off near local shops." "The injured were fully conscious and had been hit by shrapnel in various parts of their bodies - mostly limbs," he noted. "Medics carried out first aid at the scene before transporting them to Belinson hospital. No more casualties have been found at the moment." This has been a hard month for Petah Tivka, which saw two killed in a car bombing earlier this month. Police connected that incident with organized crime.